1. Hello Glynn! It is a pleasure speaking with you. Thanks for taking some time to share ideas and offer insights to our readers. I’ve been a fan of MobyMax ever since I covered the software back in May of 2013 in an article that became and remained one of the top articles on our site for drawing traffic over the following year. Clearly the potential of adaptive learning was striking a chord among our readers as well as with educators searching the web to learn more. Though you focused on algebra tutoring software when you entered the instructional technology market, you soon decided to leave that crowded space behind to concentrate on K-8 and the many needs you saw, particularly in special education. How has this decision influenced the development of the MobyMax platform? Focusing on special education first showed us how much better students learn using an adaptive curriculum that provides instant feedback. We also saw that instant, integrated progress monitoring gave teachers the information they needed to help their students succeed. We realized that there was no reason these benefits couldn’t extend to all students, classrooms, and subjects. Special ed teachers are enthusiastic, encouraging, and constantly asking us to add more subjects. Their encouragement has propelled us to develop curriculum as quick as possible which has now made us the first fully integrated curriculum. 2. 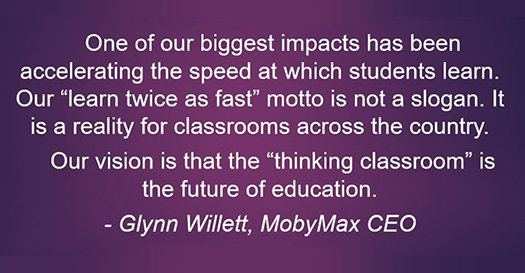 What are the biggest impacts MobyMax has had in the many schools and classrooms where it is being used? One of our biggest impacts has been accelerating the speed at which students learn. Our “Learn twice as fast” motto is not a slogan. It is a reality for classrooms across the country. MobyMax has also had a huge impact for parents and teachers who have seen how much students love to learn when they succeed. Teachers and parents have written us expressing their amazement that their students and children are working on snow days, over the weekend, and as soon as they get home. Teachers often find the biggest MobyMax impact is the amount of time an integrated data and curriculum system saves them in reporting. Teachers love being able to hand out a comprehensive report to parents and administrators. Another significant impact is cost. To have the national impact we’re having, MobyMax has to be very affordable, which it is. The cost of providing all K-8 subjects is less than $1.00 per student or if schools use the free version with less reporting, the curriculum is absolutely free. 3. I understand you are gearing up for the release of new functionality later this summer. Can you share a little more about that with our readers? By the beginning of the next school year, all of our phonics, early reading, spelling, and social studies curriculum will be released. We are continuing to accelerate our development of cognitive skill manipulatives across all our subjects. In addition, our curriculum team will be creating a robust set of tests for our assessment module as well as new deep learning lessons. For the first time, a fully integrated and highly effective curriculum for all subjects will be available to all teachers and at a cost of less than a dollar per student. 4. Looking to the horizon, we discussed your vision of successive generations of software like MobyMax. If the first generation was adaptive curriculum, you talked about how the second generation would be based around “cognitive manipulatives” that would allow students to “think their way through a subject.” Can you provide some specific examples of this? Cognitive skill manipulatives are an amazing teaching vehicle for two reasons. One is that, as a touch manipulative, they make lessons much more engaging and interactive compared to simply reading a text. Second, the “think their way through” pedagogy develops a student’s ability to problem solve and think critically. Here’s a quick science example. Imagine a student is shown how a red tomato looks in white light (the tomato looks normal) and green light (the tomato appears black but the stem appears green). The student is then asked how the tomato and stem will look in blue light. The answer is that both the tomato and stem will look black because no red or green light is reflected. Not all students will be able to deduce the answer but not getting the right answer is not critical for learning. All students are interested in knowing and understanding the answer when posed as a question and will remember the solution. 5. That sounds a lot like the Socratic Method? Exactly! The power of the Socratic method is still valid after 3,000 years. The question is more powerful than the lecture. 6. Looking ahead to MobyMax’s “3rd generation,” the term you used was “deep thinking,” and more student collaborations on team projects. This bought to mind Jonathan Armory’s TEDxYouth talk about a rich, self-directed course he oversaw at the college-preparatory high school where he teaches. Is that what you have in mind when you refer to “deep thinking?” How do you see platforms like yours evolving to support self-directed teaching and learning? I love what Armory did with his class. There is no doubt that project-based learning should be part of every student’s education in both elementary and high school. However, our upcoming “deep thinking” curriculum is actually another pedagogy that is equally needed. Our “deep thinking” curriculum is an extension of the cognitive skill manipulatives where students work through a series of questions and problems together in a class to complete the lesson for the day. In other words, students work together to “think their way through” to learn. Besides being more fun for both teachers and students, deep thinking lessons are simply a better way to learn compared to the traditional lecture. 7. So how about one further step beyond that? What do you think of as the “Holy Grail” of e-learning platforms? If you could design the ultimate environment to support learning in the most meaningful way, what might that look like? We are working to create the Holy Grail of learning platforms and we are very close to saying we are there. This is a huge project—no other company that I’ve seen is anywhere close—because there are six main systems that need to be fully integrated. We are further along in some areas than others, but our goal is to have the best-in-their-class solutions for each area. The Holy Grail for us is to have all six systems—complete curriculum system, multifaceted student motivation system, integrated progress monitoring system, classroom clicker response system, integrated district, school, teacher and student data system, and formative and summative assessment system—all included in one low price. 8. I’ve been inspired by a number of education technology-focused publications like Sal Khan’s One World Schoolhouse, Sams and Bergmann’s Flip Your Class: Reach Every Student in Every Class Every Day, and by the work of student motivation experts like Larry Ferlazzo and Angela Maiers. I like to ask education entrepreneurs like yourself … who, or what, do you look to for motivation to keep learning and improving? Our teachers inspire us the most. The heart-warming stories and pictures they send us are so motivating! For me, it’s impossible not to be motivated when working with kids. We are creating a community of teachers who can share their passion for their students, for MobyMax, and for their work. I love the idea of hosting a huge party with hundreds, maybe thousands, of teachers coming together to exchange what they know, learn from their peers, and have a lot of fun! Now that will be truly inspiring. 9. With the time and energy you’ve devoted to education and technology in the last few years, I’m curious … if you had just one recommendation to make to teachers everywhere regarding the integration of technology and education, what would that be? From the 30,000-foot perspective, I’d say embrace technology as soon as you possibly can. It will make your job much easier, your students will succeed sooner, and learning will become a delight, not a chore. At ground level, for elementary teachers, I recommend using technology to address the need we initially developed “Moby Math” for—fix missing math skills. With technology, students can quickly master math skills that are holding them back. However, I’d be remiss in not also recommending using MobyMax Cognitive Skill Science at least as supplemental curriculum. Science will quickly become your students’ favorite course. 10 . How about Administration? What are the most important recommendations you would like to drive home for administrators and leaders at other institutions regarding the integration of technology and education? Back when e-curriculum was delivered on CD-ROMs, the expression describing many products purchased by administrators for their teachers was “shelf ware” because the teachers just left the CD-ROMS on the shelf and never used the curriculum. MobyMax gives administrators the ability to see exactly how their teachers and students are doing in real time and can quickly identify trouble spots. The biggest issue facing administrators is fidelity in implementation. All products they purchase should give them the ability to easily ensure quality implementation, which is what they get with MobyMax. 11. Any additional thoughts, observations, or future plans you would like to share with EmergingEdTech readers? I think your readers might enjoy a glimpse of this future. Imagine students starting their math class and seeing that their teacher has created a special goal and reward if they complete 60 problems correctly that day. They’ll also receive five additional play minutes in a new game. Students start work in the skill areas already identified as needing help from their continual formative assessments. If they get stuck, the students message their teacher (or message teachers from around the globe.) The teacher can tell at a glance if students are having difficulty or are not on task. After 15 minutes of adaptive math practice with immediate feedback, the teacher begins their deep thinking lesson. The lesson employs three distinct pedagogies to create the “thinking classroom” and utilizes the clicker response system to facilitate the classroom discussion and ensure that all students are thinking and participating. When the first question is displayed on the whiteboard, the students solve the problem on their own whiteboards, showing their work. The students’ answers are collated and students can see the results. The teacher leads the discussion so students will think deeply and explain why an answer might be wrong. (The “wrong answer” pedagogy is one way to deeply understand a concept.) The teacher then leads the discussion on different “right answers” because there is more than one way to solve a problem. You can think of the right and wrong answer discussions as a warmup for the third pedagogy—discover the principal yourself. In other words, rather than simply telling students the formula a2 + b2 = c2, the deep thinking approach helps the classroom discover this formula on their own. But more than that, the students are asked how this formula can be used in their lives. For example, a deep thinking question can help students understand how to apply the Pythagorean Theorem to build a square clubhouse. Questions are structured to lead students to figure out math concepts without being told. Notice how different this is compared to the traditional classroom or the flipped classroom. Class time isn’t reserved for lecturing or practicing problems because both are quickly done in an adaptive environment. Instead, the classroom is reserved for thinking. Our vision is that the “thinking classroom” is the future of education. Thanks again Glynn and continued luck to you and to MobyMax!